There is no universal preference for choosing Managed or Referenced files. 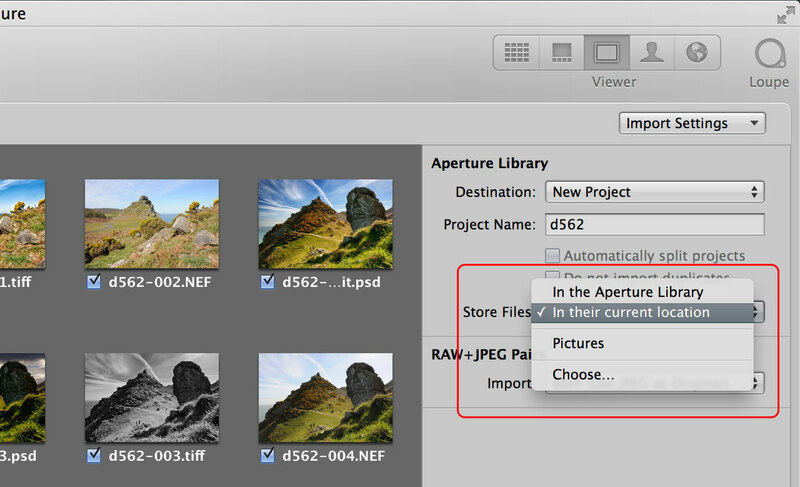 You have to choose each time you import your pictures, though Aperture will remember your last choice. I’m assuming you’re importing pictures you’ve already copied on to a permanent drive. 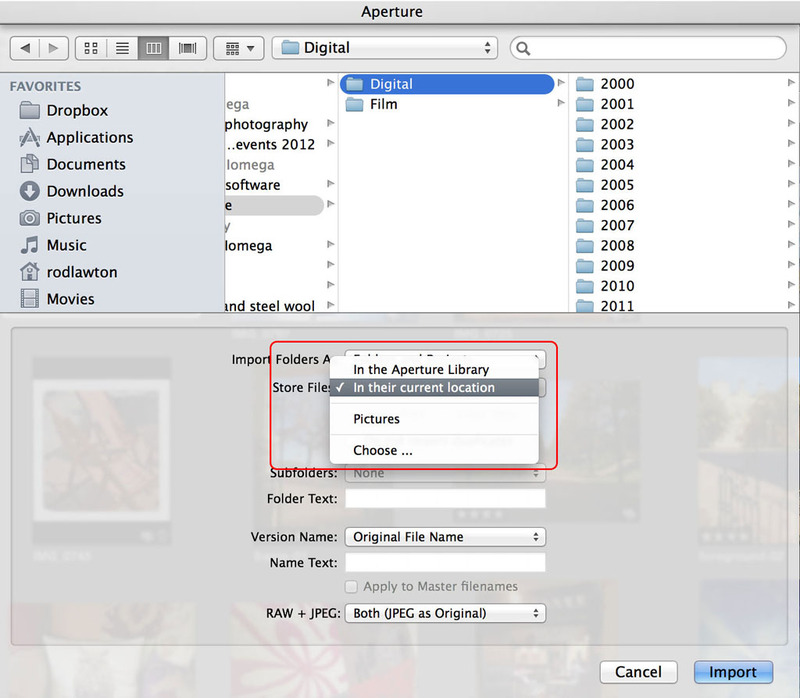 If you’re importing direct from a memory card, you must either import them into the Aperture library or choose a new location to copy them to. If you don’t, you’ll be referencing images on a volume that’s going to be removed, erased and re-used, so you’ll lose your originals. Be warned! • Import button (This is the same as the File > Import > Files menu command): Over in the right sidebar you’ll see an Import Settings panel. There’s a drop-down ‘Store Files’ menu, and you choose ‘in the Aperture Library’ if you want Aperture to manage them, or ‘in their current location’ to reference them where they are. • Import Folders as Projects (via the File > Import menu): This time you see a Finder-style dialog which you use to locate the folders you want to import. The ‘Store Files’ drop-down is here too, with the same options for managing or referencing your files. 04 So all your files can be referenced if you want? • Photo stream: If you enable Photo stream, pictures taken on your iOS devices will be imported into the Aperture library automatically, which is good, but you don’t get the option to save them as referenced files which will be visible to other applications. • Drag and drop: You can drop photos and folders on to the Aperture icon in the Dock and they will be added to your library. Again, though, they are imported as managed files, not referenced in their current location. 05 So how can you tell which is which? 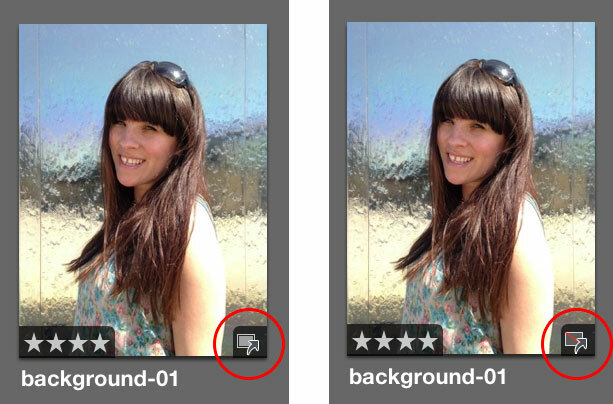 Aperture adds a special badge to the bottom right corner of the thumbnails of referenced images. If the masters are ‘offline’ (on another drive not currently available) the badge displays a red warning symbol, but because Aperture creates internal previews of your photos, you will still be able to look at a larger version as well as the thumbnail. This is what the badge looks like. If you don’t see it, your files are managed; if you do, your files are referenced. If you unplug your external drive and the referenced images are no longer available, there’s a red line through it.